The old world charms and grandeur of the forts and palaces of Jaipur are almost hypnotic, teleporting you back to the time of royal opulence. 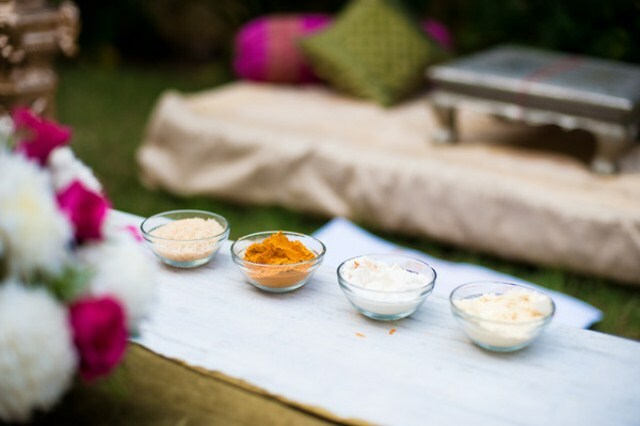 When you are planning a destination wedding in Jaipur, the choices of venues can get a little confusing as there are way too many gorgeous properties to choose from. 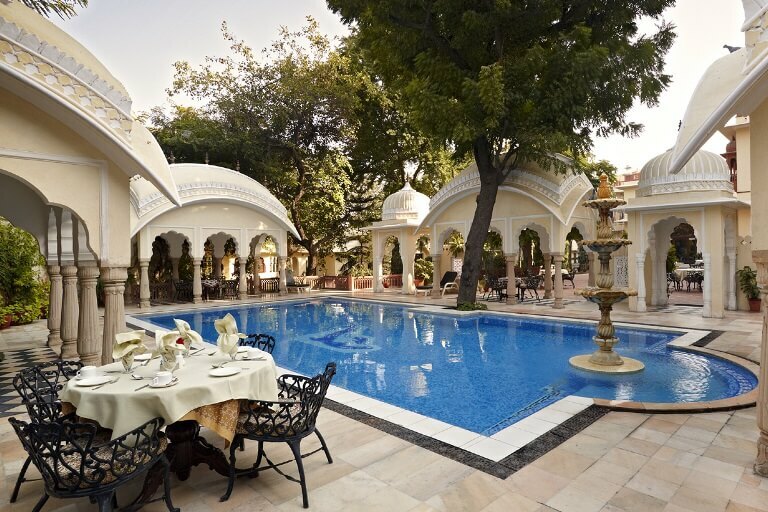 You could always choose from magnificent palaces like Samode Palace, Raj Palace, Tai Jai Mahal, or Taj Rambagh Palace, which give royalty a new definition. But what if you do not want to spend a bomb and have a wedding that exudes stately charms and grace. The plan B is to have a wedding at one of its many elegant and age-old havelis. The heritage mansions are a proper fix for those desirous of a wedding that is less costly but charming beyond compare. And here’s the thing, most of the luxurious properties lets you rent out their venue for the wedding ceremonies. 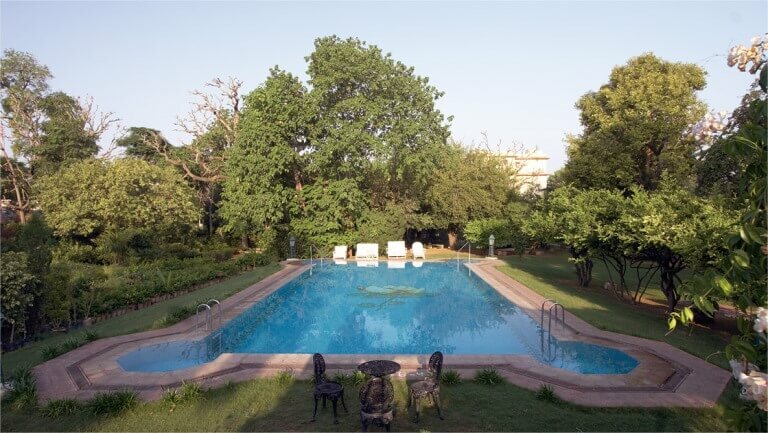 So you could always choose to have your main event at let’s say baradari lawns of Taj Jai Mahal palace or the luxurious banquet halls of ITC Rajputana while staying at some haveli and have pre/ post wedding functions here. 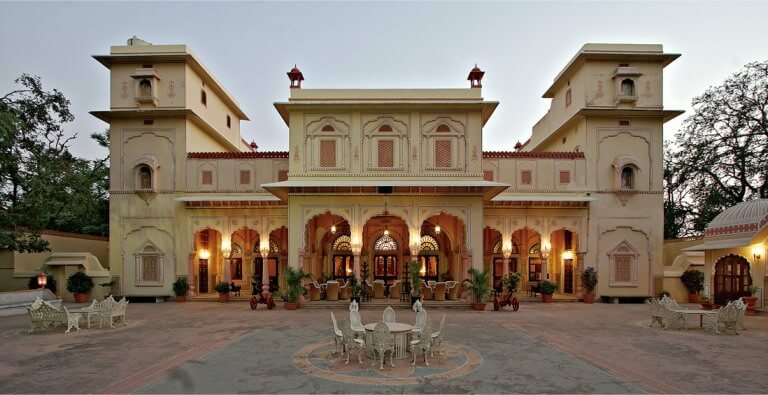 So we have curated the list of Jaipur’s most alluring mansions. The quaint and quiet castle is a contrast to the hustle and bustle of the city life outside its walls. 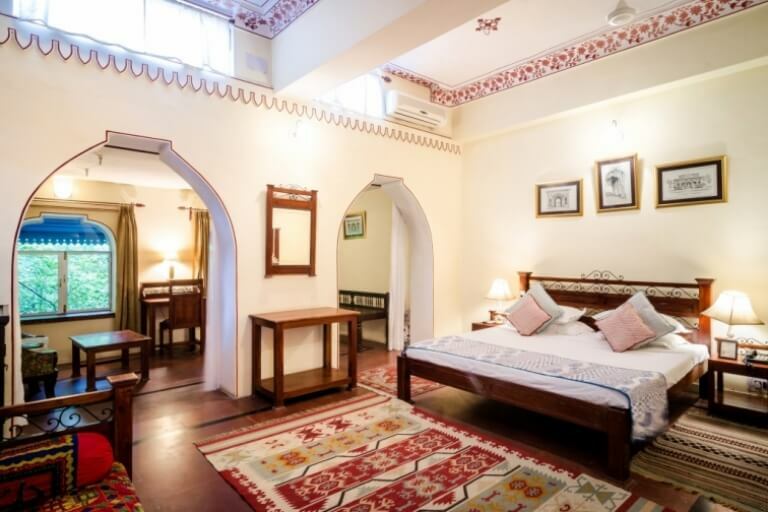 Experience the charms of Rajputana era, its 22 rooms could be booked for a wedding ceremony of up to 50 guests or for bigger guests list, you could always split the guest party into two properties. 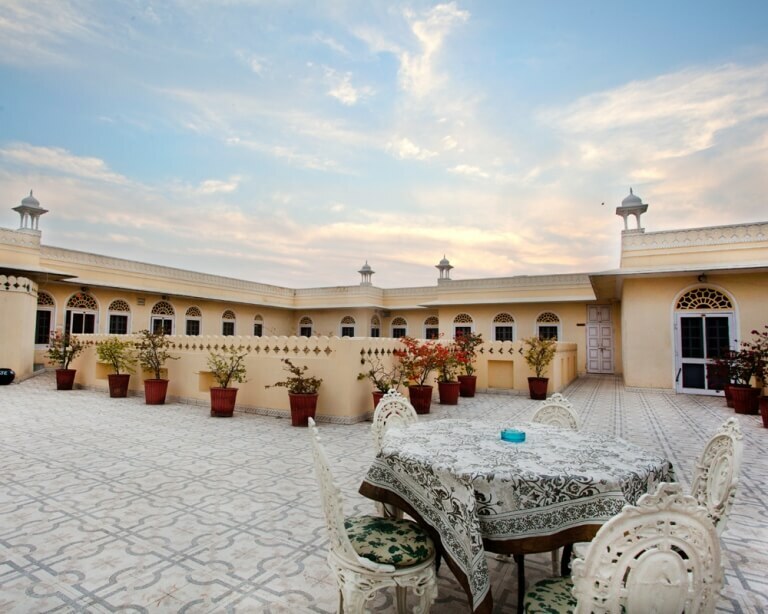 Huge courtyard with a marble fountain and pool on the terrace of Khandela Haveli are a great spot to unwind with your guests and have an intimate Mehendi or pre-wedding ceremonies. We had planned a wedding in Jaipur some time back, where the bride’s party had stayed here, and we organized their Mehendi function at the courtyard while the buffet was laid out at the rooftop, with the live entertainment by folk dancers and puppeteers. You could read more about it here. 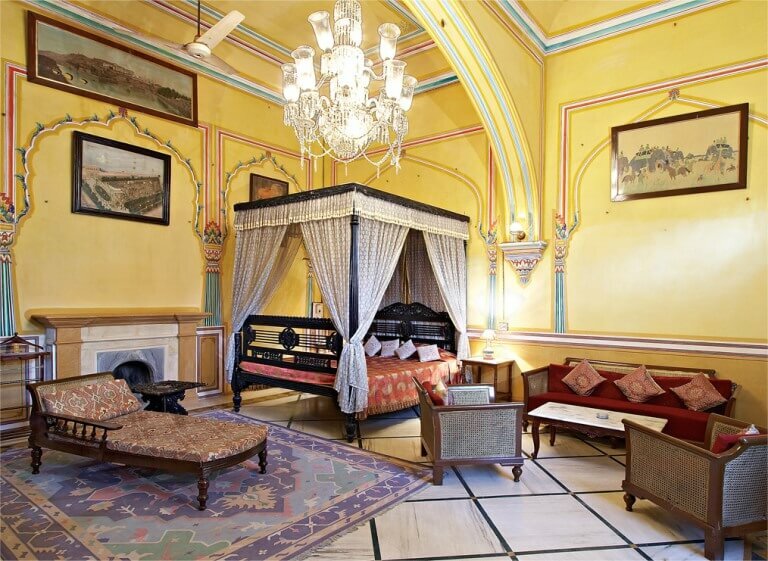 Alsisar Haveli is a sweet reminder of the majestic Rajputana era. 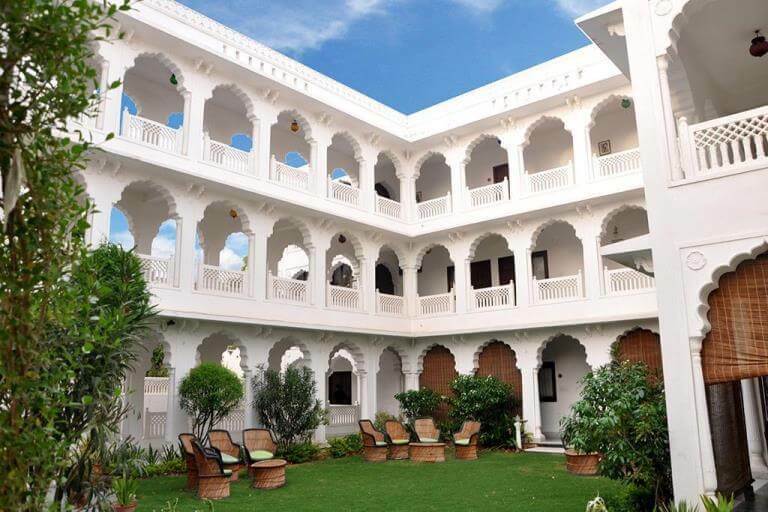 The former royal family mansion has been restored and refurbished and converted to heritage haveli. The heritages styled rooms are a great way to give your guests the taste of the grandeur of the past and can accommodate up to 90 guests. 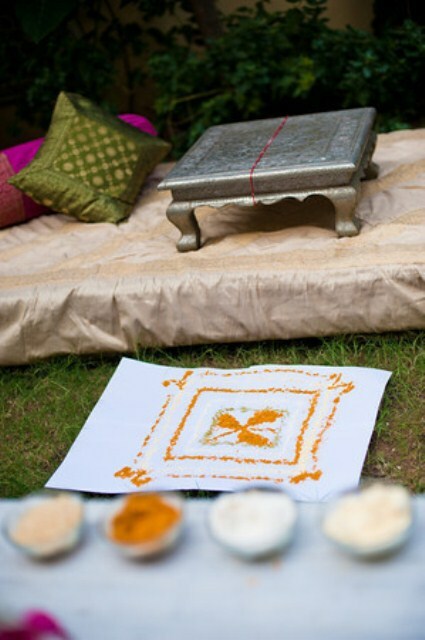 Wedding arrangements could be made at its courtyard or lush gardens. 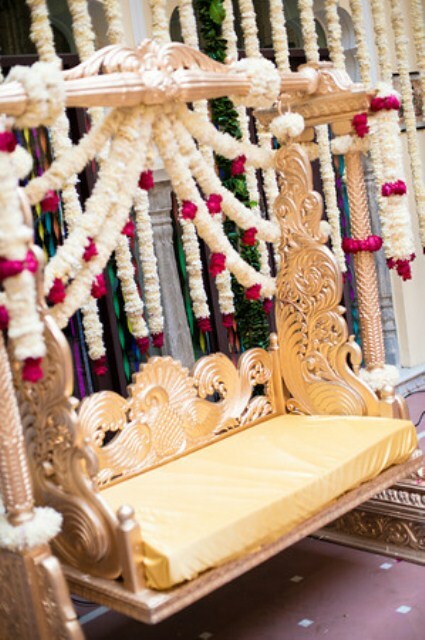 You could also choose to have an intimate get together at its Sheesh mahal banquet hall or for the bigger events you could opt for Darbar hall with intricate traditional patterns on the walls. Located in the heart of the city, when you step inside the walls of Hotel Diggi Palace, the tranquility of it first pleasantly surprises you and then soothes you. 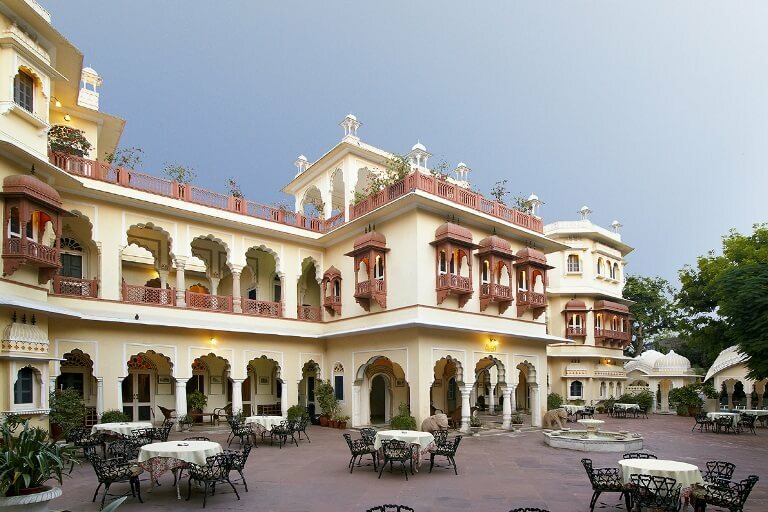 It is an apt heritage hotel for your wedding in Jaipur. 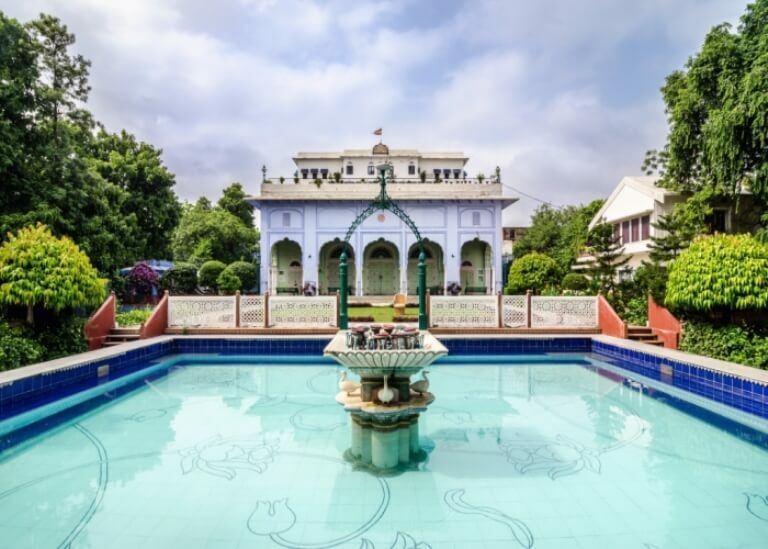 Converted into heritage property, it is owned by the royal family, who also manages it, showcasing and preserving the rich culture of Rajasthan. 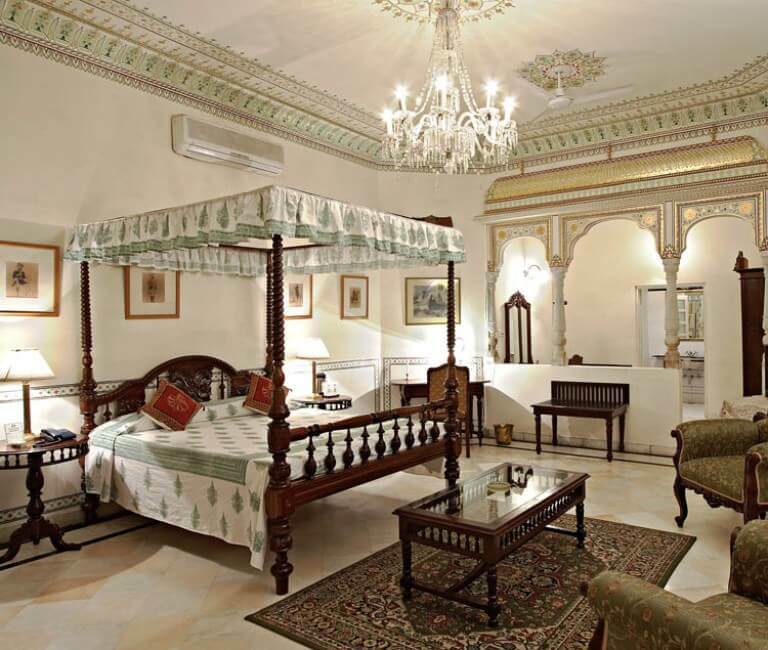 The hotel is also the cultural hub of the city, has been hosting Jaipur Literary Festival since 2006. It has 31 heritage rooms, 31 palace suites, and 10 courtyard suites to accommodate your guests and give them an unforgettable royalty experience. 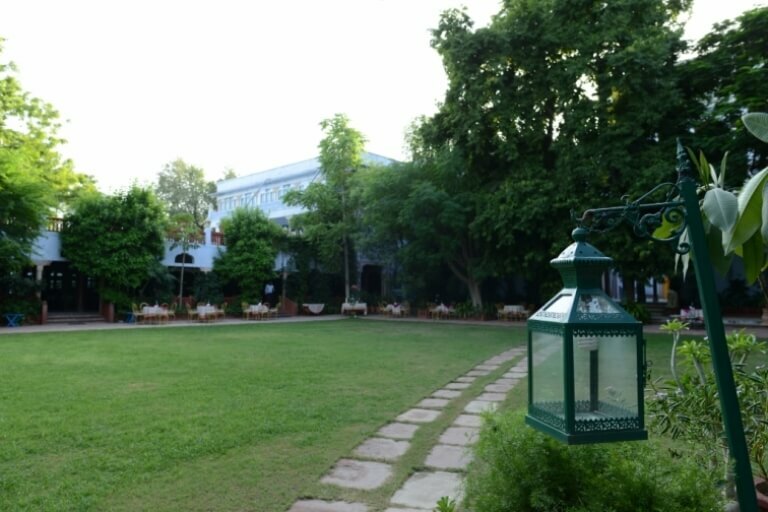 The hotel is surrounded by acres of shaded gardens and would be a great venue for your destination wedding in Jaipur. The hotel uses the organic produce from its many gardens and farms, so a great way to reduce the carbon footprint of your wedding. Located the outskirts of Jaipur in a charming village Sirsi, it is a delightful heritage hotel for your wedding in Jaipur. It is said, Sirsi haveli was used by the Maharaja of Jaipur as he visited the village to offer prayers at the local temple. 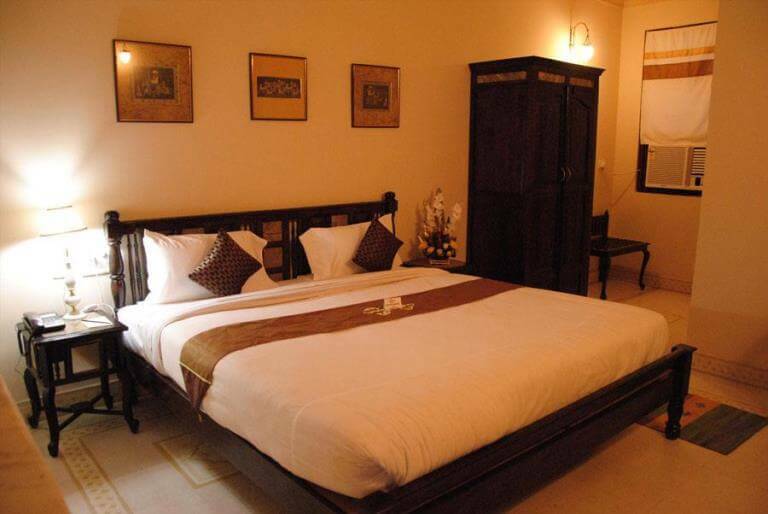 It has elegantly furnished 11 rooms and 07 suites, which are more suited for a small wedding. 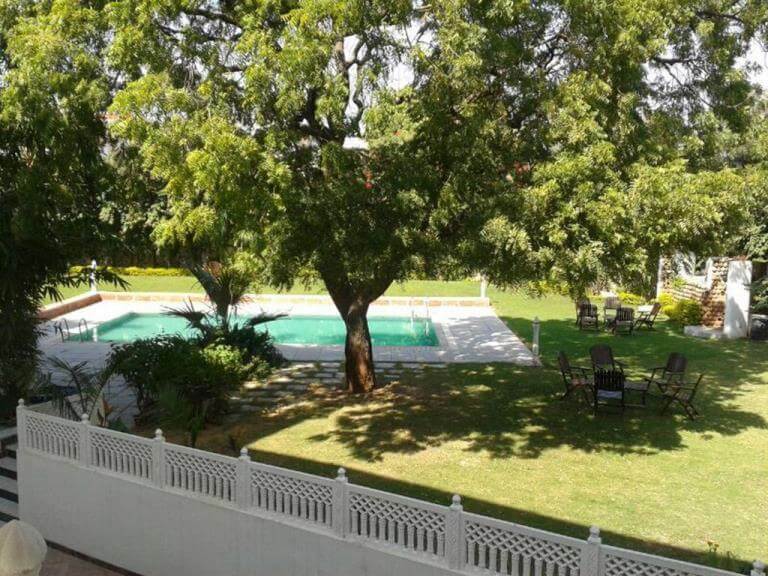 You could hire the entire property, have a lovely rustic wedding in its gardens and have the privacy too. 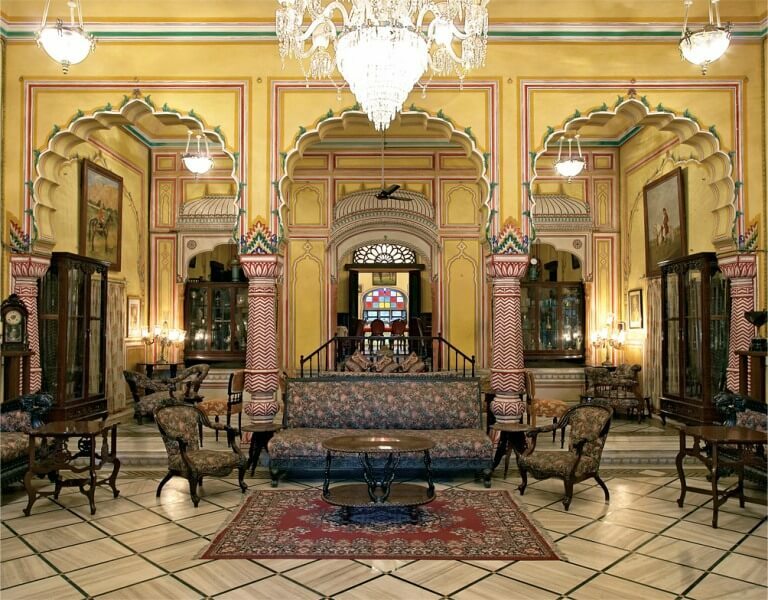 Located centrally in the city, Narain Niwas is an enchanting heritage hotel in Jaipur that served as a country resort for the Kanota royalty. 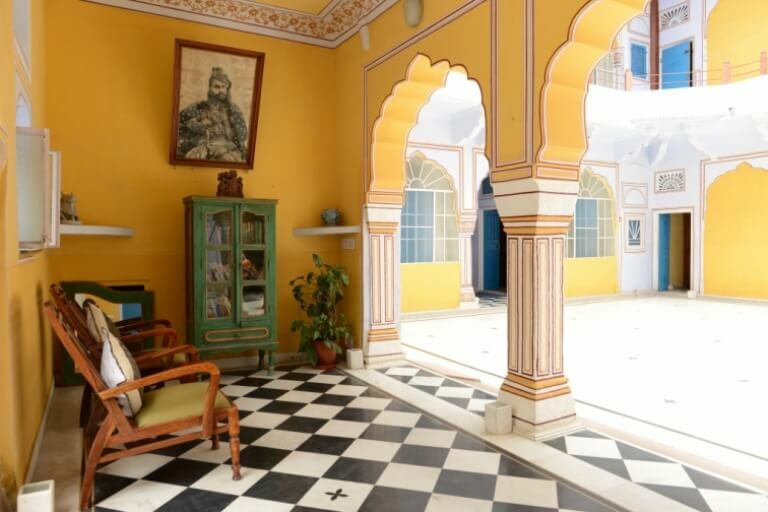 Built in 1928, it has been made in Anglo-Victorian style, while the interiors are done in traditional Rajasthani furnishings and the walls are done in the vibrant hues, the quirky property will hit the right chords with you and your guests. The pre-wedding ceremonies could be organized here while the main ceremony could be planned at Castle Kanota, especially dedicated to hosting weddings, or if you like some of you guests could stay there too. These decadent mansions or heritage hotels are your tickets to re-live the princely life and have a wedding ceremony that exudes royal charms. We at Memorable Indian Weddings have a special spot in our hearts for these boutique heritage havelis which are so full of character and history, we would be utterly happy to help you plan your royal wedding in Rajasthan.